Do you need help to get in and out of the bath ? Well, for those with reduced strength, balance and co-ordination problems taking a bath safely can be a real problem. In addition, wet surfaces add to the risk of someone slipping and falling over in the bath, particularly when getting in and out. 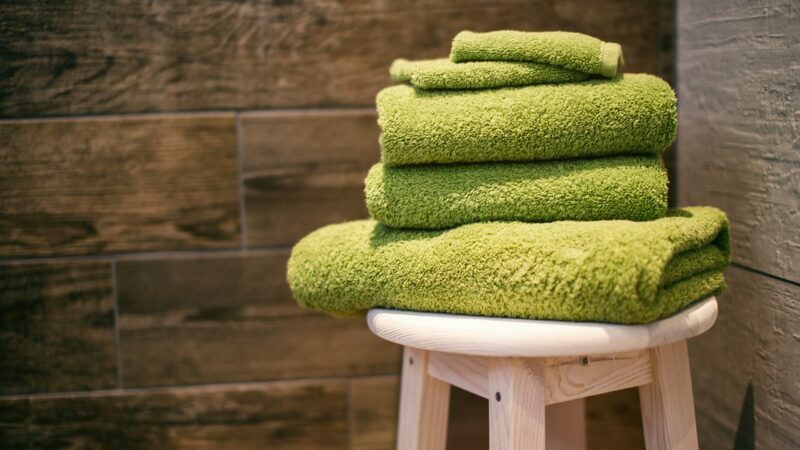 Simple bath seats and chairs for the elderly can make a big difference to helping a person manage this regular activity of daily living safely, allowing you to have a nice relaxing soak whenever you want. Many of the bath seats and chairs are lightweight, sturdy and can easily fit into the smallest bath giving you increased confidence and independence with your personal care. Some can also be used in showers and wet rooms. 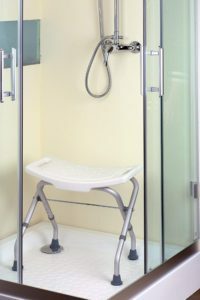 For details of a selection of shower seats and chairs available for the elderly Click here. They are also useful for those with showers over their baths who want to avoid standing up when showering, and are available in a wide range of sizes and designs. So what different styles of bath seats and chairs are suitable for you ? so let’s take a closer look at each style and the main features and benefits of them. The slatted bath seats and chairs have slats in them which allows the water to drain away quickly. They are suitable for either acrylic or enamel baths, and are often used in conjunction with a bath board. The Homecraft Savanah Slatted Bath Bench is a strong and comfortable seat. It is made of a sturdy PVC construction with smooth, accessible surfaces for ease of cleaning and comfort. Slatted face and rubber buffers on the brackets secure board on to the bath tub. 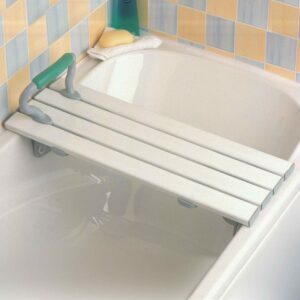 If you need extra support when sat on the bath bench then you can add on an optional grab handle as pictured. 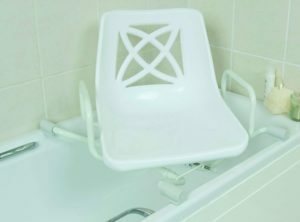 These removable seats are available in a range of heights in the bath allowing the user to sit at different depths in the water when bathing. The user requires good upper body strength and balance when lowering themselves into the bath, and likewise when standing and stepping out of the bath. They are available in a range of materials depending on the needs of the user and the height of the bath. They can be used with bath boards, over bath showers and are often used with additional grab rails to help you manouvre safely. A popular choice is the Homecraft Lightweight Suspended Bath Seat is a simple design made of lightweight aluminium, with no assembly or adjustment necessary. It is suitable for baths with an internal measurement of 585 – 670mm (23 – 26 3/8″). If you feel you need some additional back support when sat on the seat then there are other products available. The main features of the Patterson Medical White Line Suspended Bath Seat is the horse shoe front cut out which helps with personal cleaning, and the small hole design to help the water drain away more easily. The plastic backrest gives you added support when bathing, and the seat is also width adjustable to fit most size baths. Swivel Bath Seats are fully adjustable and are versatile and functional for the user. The bath seat easily fits over most standard baths and most rotate through 360 degrees ensuring the user has a safer, easier and more comfortable means of accessing the bath. Swivel bath seats are suitable for most baths, as long as the bath rim is wide enough to support the seat frame. They are available in a range of sizes including narrow or corner baths. Some models are multi-adjustable to fit a range of bath widths. The NRS Healthcare Width Adjustable Swivel Bath Seat has a sturdy white corrosion resistant aluminium frame, and the seat’s base has slip resistant grips that are effective even in wet conditions. The armrests support make transfers safer for the user, and it is easily adjustable without the need for any tools. It has a locking lever mechanism, which will secure the seat in a fixed position when the user is getting on and off it, and once sitting in the middle of the bath. Depending on the user’s strength and balance a grab rail positioned on the wall above the bath side may assist with swiveling the seat over the bath. A carer or family member may be needed to lift your legs into the bath if you cannot lift them yourself. Both practical and space-saving folding bath seats can easily be folded away when not in use. Perfect if other members of the household also use the bath. Many of the bath seats have integrated fixed handles to give you additional support and help you get on and off it safely. These seats can also be used in the shower. Click here to see an extensive range of folding shower seats and chairs for the elderly. A perfect addition for anyone bathing is the Aging Care bathtub & shower stool.The ergonomically designed and ventilated contoured seat (W 50cm; L 30cm) gives you a stable seating area, and at the same time facilitates a controlled and hygienic draining of water when washing. This gives you a practical safe way for you to wash. It height is easily adjustable from 44cm to 49cm to ensure it is the optimum height for you. Bath boards remove the need for stepping into the bath greatly reducing the risk of a slip or fall. The boards come in different standard widths, and also adjustable widths to accommodate different sizes and styles of baths. There are even combined bath boards and seats available. They provide a stable platform across the bath and most can be locked into position to provide a sturdy support when sat on them. For those who struggle to slide their legs up and over the bath from a seated position, a small step can be a handy addition to have. Also, an additional grab rail support on the bath wall provides additional support when bathing. A standard plastic white seat is a popular option as it normally blends in well with most existing bathroom designs, however, wooden bath boards are also available. In instances where a bath board cannot be fitted due to the shape of the bath then a bath bench can be used. Transfer bath benches provide a safe and convenient way of getting in and out of the bath. Longer than a standard bath board they extend over the rim of the bath with leg support on the floor, as well as in the b ath. For someone who requires back support when sat or feel unsteady with poor sitting balance, then a transfer bath bench is a better option than a standard bath board. 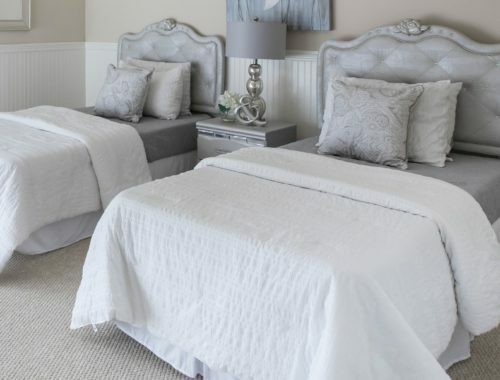 Bath benches do take up more room than a conventional bath board so may not be appropriate for someone with a small bathroom, or has other equipment in it such as a perching stool. They also can be as little heavier and bulky to manouvre around, depending on the type of material used. Most transfer benches have a sliding seat making it easier to slide along, and many also come with handle support to assist you. They also can be used left or right-handed, depending on how the bath is installed. 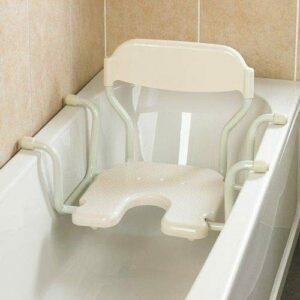 For people with severe mobility problems a bath lift would be a suitable alternative to a bath board or seat. They tend to be a lot more expensive and can either be removable or fixed to your bath. There are many styles and types of bath lifts available – portable free standing lifts that do not require any installation and some attached to the wall, floor or ceiling. The portable bath lifts are available in either battery-powered, air-powered, water-powered, or on some lifts a manual crank is used. The battery-powered bath lifts are a popular choice for many people. Many have reclining back support and are lightweight and portable, ideal for easy transportation and storage. Most battery-powered bath lifts can operate between 4-20 lifts per battery charge before needing to be recharged. The Bellavita reclining bath lift is the lightest battery-powered reclining bath lift available, with the seat backrest reclining to a market leading 50º, and also the seat is one of the highest at 48cm (18.9″).Click here to read my personal review of the Bellavita Reclining Bath Lift. Air-powered or Air Inflatable bath lifts tend to be more suited to someone of a smaller stature, with perhaps better balance and co-ordination. This type of lift has an air-inflatable cushion that is filled by a battery-powered air compressor. The soft flexible seat moulds around your body when you are sat on it and tends to be of a lower height than the battery-powered bath lifts. Water-powered bath lifts are powered by your home’s water pressure. The bath lift is attached to a shower pipe, or diverter pipe and the water pressure raises and lowers the bath lift. The water-powered lifts tend to be used less and less as they are more time-consuming to set up, and more people find the battery powered option a preferred choice. Many of the slatted and folding bath seats and chairs discussed can also be used in the shower. For more information about the different styles available take a look at Shower seats for the elderly by clicking here. Hopefully, the above information provides a comprehensive guide to choosing the best type of bath seats & chairs for the elderly. Consider the various options available to you, as each person will have their own individual specific needs as to what style and type they need. 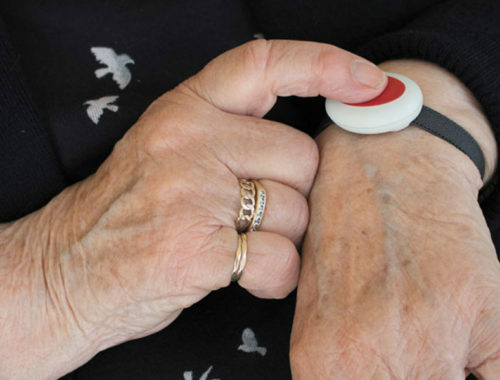 If you have any questions, or other products you are interested in or need reviewing, please do not hesitate to contact me at mark@elderlyfallsprevention.com and I will be happy to answer any queries. I enjoyed your article about the benefits brings bath seats and chairs made for all people ! I think that I will bookmark your site for more info ! I am glad you found the information useful. Please contact me if you have any questions regarding specific products and I will be glad to help. My grandfather is at a very advanced age, and he has some difficulty in getting in and out of the tub. I understand there are so many options on your site, so I am wondering what choice would you recommend to someone who is able to get in and out but just needs a little support in case he accidentally slips. Thanks for checking out Bath seats and chairs for the elderly. In the case of your grandfather, if he is able to get in and out of the bath unaided and has good sitting balance, then a bath board or transfer bench may be a good option. Obviously without knowing a little more about your grandfather’s general mobility and health it is difficult to be sure which he would benefit from most. A non slip mat in the bath, and for some people a grab rail support on the side of the bath are also beneficial in reducing the risk of falls. I hope this helps – if you need any further information please get in touch again and I will be glad to help. Thanks for your lovely comments Carmen, I am glad you found bath seats and chairs for the elderly useful. Please feel free to get in touch if you need any further advice or information and I will be happy to help. Thanks for this post, Mark, very informative. Based on your reviews, I think we are going to fit my father-in-law’s bath with a bath lift. He has a prosthetic leg and we’ve already equipped his shower with a bench, but he sometimes just wants a bath and is not stable enough. Thanks for your help! I am glad you found bath seats and chairs for the elderly useful for your father-in-law. If you need any help or advice about which product may suit him best, please do not hesitate to contact me further. These are a good selection of bath seats and chairs, which is very helpful to support elders in the toilet. Thanks for the feedback Jacob, I am glad you found the information useful.